First of all, there is little doubt that no-one in this country should be having to choose between heating and eating. There is nothing wrong with Ed Miliband and the Labour Party being prepared to consider radical solutions to this. But they should come clean with what they are trying to do, because it it becoming more and more apparent that their policies are leading to nationalization of the energy industry by stealth. As he has done many times during this Parliament, Miliband has put himself on the ‘right’ side of a major issue for the majority of the population. Warmth is one of the five main necessities we have, along with food, water, clothing and shelter. Our economic system is struggling to provide warmth for too many of our fellow citizens at a price they can afford. People shouldn’t be shivering under blankets in winter because they can’t afford to have heat on, food banks should not be concerned about giving food to people that they have to eat because they can’t afford to heat it. This needs to be set against the dividends that energy companies are paying out to shareholders, a share of profits achieved on the back of price rises way over inflation. Miliband has done a lot of work on this, but not for the first time, his answer doesn’t make sense, certainly not economic sense. He announced a review of the market structure of the energy market, resolving to replace the current regulator, OFGEM, with a far more activist and powerful one. 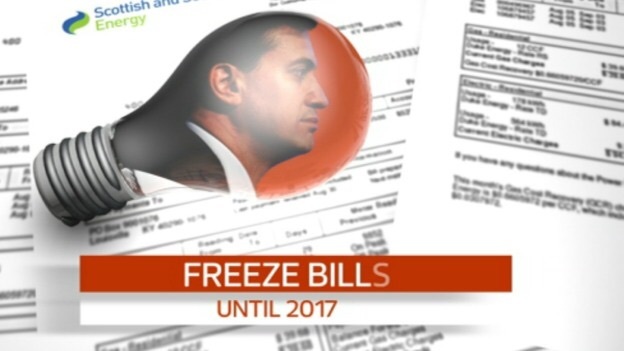 Whilst that was going on, he announced he would freeze energy prices for two years should Labour get into Government on May 7th. The impact of this plan has already been felt. If you regulate prices for an industry that has little control over their costs, you risk major unintended consequences. Put simply,any company in this position will want their prices to be as high as possible when they are frozen. This explains why energy companies haven’t lowered prices as their wholesale costs have fallen. It would make no sense when their costs can rise and fall beyond their control in the future to allow their prices to fall low enough that should their wholesale costs rise again they would be stuck on a frozen price that means they would make a loss. Energy companies have said so in their communications to investors, not only explaining that the chances of Labour being in government are high enough that they cannot cut prices as they might want to, but also essentially issuing a future profit warning if Labour get in – so hostile will the regulatory environment be. Energy companies need to invest. They need to invest to meet our growing energy capacity needs as the population grown in number and in age. They also need to keep investing in renewable energy as per our commitments to various climate change agreements. To invest, they need profits, and the uncertain regulatory environment means they are less likely to invest. Miliband cares little for this – he now wants to legislate to force them to lower their prices as costs fall, despite having told the companies that they will be unlikely to have control over their prices in the future (when costs may well rise). If I were an investor in an energy company, I would get out now, as many did yesterday when share prices in energy firms fell. Those with an agenda on energy firms are prone to use absolute terms for reporting their profits, so they talk in billions of pounds to attract the most opprobrium to them. But energy firms actually make a lower profit MARGIN compared to their costs than the supermarkets do. Their profits are as large as they are because they serve so many customers. They serve so many customers because they need to be at the scale they are to take advantage of the economies of scale (lower costs available if you are a certain size) that allows them to keep costs down. Miliband has talked of breaking up the energy market to introduce competition, but that could actually RAISE costs and therefore prices if the smaller firms that would result cannot access those economies of scale. Ultimately, Ed Miliband needs to come clean. The problem really is that we have private firms, some owned by foreign companies, who provide one of the five basic needs for a profit. That profit provides an incentive to operate, provides an incentive to invest in more efficient energy production, but also provides an incentive to raise prices when costs rise but not lower them when costs fall. Miliband has every right to feel that UK customers are not best served by the Energy industry being in private hands. But he should SAY he feels like that, and admit that he is aiming to renationalise it. Renationalising the energy industry would result in the government being able to decide what prices customers can get. Renationalising it could mean that the energy industry is run once again for the benefit of consumers. Renationalising it could mean that profits are spent on investment instead of paid out to faceless shareholders. There is of course another side to it, in that the lack of any profit incentive or competition could mean that costs rise, prices rise, and the government find it impossible to coordinate such a behemoth of an industry. It could mean that the constant investment needed to meet our required capacity needs in the future doesn’t happen. But that is all in theory. At the moment, his constant threats of intervention, and actual legislation for intervention may result eventually in some of the energy firms struggling to make a profit, and requiring help from government in a manner that could lead to re-nationalisation anyway. Is that what Ed Miliband wants? We should be told.